The 2017 Nasco Showing & Grooming catalog, featuring carefully selected products for showing and grooming livestock, is available from Nasco in Fort Atkinson, Wisconsin, and Modesto, California. 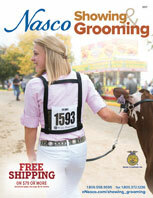 Nasco’s 84-page Showing & Grooming catalog contains all the supplies needed to prepare an animal to exhibit at County and State Fairs, regional events, and Jackpot shows. The newly expanded catalog offers halters, clippers, grooming chutes, show boxes, hoof care products, barn fans, blowers, dryers, vacuums, shampoos, aerosols, combs, brushes, and much more.